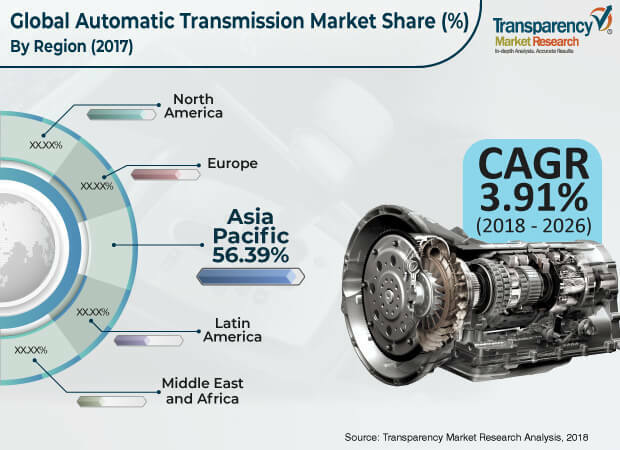 Transparency Market Research has published a new report titled, “Global Automatic Transmission Market [Transmission Type: Automatic Transmission (AT), Automated Manual Transmission (AMT), Continuously Variable Transmission (CVT) and Dual Clutch Transmission (DCT); Vehicle Passenger Vehicle, Commercial Vehicle] - Global Industry Analysis, Size, Share, Growth, Trends, and Forecast, 2018–2026.” According to the report, the global automatic transmission market is projected to surpass US$ 90 Bn by 2026, expanding at a CAGR of above 3% during the forecast period. According to the report, the global automatic transmission market is likely to be driven by a range of macroeconomic and industry-specific factors. Asia Pacific is expected to be at the forefront of global demand, with the market in the region expanding at a CAGR of 3.86% between 2018 and 2026. An automotive transmission ensures smooth shifting of gears in a vehicle to transfer torque generated by the engine to drive the vehicle. Automatic transmission consists of sensors and actuators that change gears at different speeds smoothly without the intervention of the driver. Automatic transmission offers a leisurely driving experience and hence, automatic transmission is gaining popularity among consumers and auto manufacturers. The types of transmissions available include continuously variable transmission (CVT) and automated manual transmission (AMT). Regulatory bodies in different regions have enacted rigid standards regarding emission, which is expected to boost the demand for automatic transmission during the forecast period. Rising demand for fuel-efficient vehicles and quality driving experience from consumers is anticipated drive the automatic transmission market during the forecast period. In terms of transmission type, the global automatic transmission market has been divided into automated manual transmission (AMT), automatic transmission (AT), continuously variable transmission (CVT), and dual clutch transmission (DCT). The automated manual transmission (AMT) segment is likely to expand at a significant pace owing to its considerable adoption in heavy commercial vehicles and hatchbacks cars due to the significant demand for fuel efficiency coupled with a comfortable drive. Automated manual transmission offers flexibility such as most AMT is equipped in the manual mode, which can be used as a manual transmission; the AMT is designed in such way that it offers maximum fuel efficiency. Continuously variable transmission (CVT) offers infinite number of gear ratios within the maximum and minimum range. CVT offers better engine control along with fuel economy, also gear change in this transmission is smooth. Major vehicle manufacturers such as Toyota, Honda, Nissan, and Mitsubishi provide CVT in their vehicles. In terms of vehicle, the automatic transmission market has been classified into passenger vehicle and commercial vehicle. The passenger vehicle segment is anticipated to dominate the automatic transmission market during the forecast period. Rise in rate of rise in sales of passenger vehicles across the globe is anticipated to drive the automatic transmission market. Modern hatchbacks are mostly equipped with the automated manual transmission (AMT) owing to the demand for fuel efficiency, while sedans are equipped with continuously variable transmission (CVT) for better fuel efficiency and engine control. However, increasing adoption of automatic transmission in commercial vehicles for comfortable drive and easy shifting of gears is expected to boost the demand for automatic transmission during the forecast period. In terms of region, the global automatic transmission market has been segregated into North America, Europe, Asia Pacific, Middle East & Africa, and Latin America. Asia Pacific is a prominent market for automatic transmission. The market in Asia Pacific is anticipated to expand at a significant pace during the forecast period. Increasing trend of adoption of latest technology in Asia Pacific, owing to the presence of major auto manufacturers, such as Toyota, Hyundai, and Volkswagen, is likely to boost the market. Presence of key automatic transmission manufacturers in Asia Pacific is anticipated to drive the automatic transmission market during the forecast period. Prominent players operating in the global automatic transmission market include AISIN SEIKI Co., Ltd., Allison Transmission Inc., BorgWarner Inc., Eaton, JATCO Ltd. Magneti Marelli S.p.A, Voith GmbH & Co. KGaA, ZF Friedrichshafen AG, Magna International Inc., Schaeffler Technologies AG & Co. KG, EXEDY Corporation, GKN PLC, and WABCO.